With hours to go before the 2018 NFL Draft, the one certainty so far is uncertainty with what the Chicago Bears will actually do with the pick. The Bears are one of few teams in the top 10 that don’t need a quarterback, something that will likely benefit them come Thursday night. General Manager Ryan Pace has the possibility of drafting a really good player on defense, possibly a generational talent in Quenton Nelson and also has the luxury of trading down to accumulate more draft picks at the cost of risking said talent. 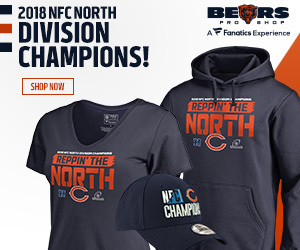 The Bears are currently due to select No. 8 in the draft and could address their need at the linebacker position with several high-quality options. In several mock drafts, pundits and prognosticators have the Bears either taking Virginia Tech linebacker Tremaine Edmunds or Georgia linebacker Roquan Smith. Both are regarded as the two best linebacker prospects in the draft. If the Bears were to trade down even two spots with the Miami Dolphins at No. 11, they could risk missing out on both talents, something Pace needs to realize the magnitude of the decision. Edmunds has garnered high marks for his outstanding athleticism for his size at the position. Standing at 6-foot-4 and 200-pounds, he offers the potential upside to be a tremendous talent. His inexperience weighs heavily on his draft value as many view him as a high-risk, high-reward project with an undetermined position at either inside or outside linebacker. Many have compared his athleticism to that of Hall of Fame-bound Brian Urlacher who was regarded as being on of the best physically gifted football players of the recent decade. Pace can afford to gamble with drafting Edmunds as he has one of the best defensive coordinators in the NFL coaching his defense Vic Fangio. Fangio has been in the league as a defensive coach since 1986 and even most recently coached up a project pick drafted by Pace. Edmund’s is similar to that of outside linebacker Leonard Floyd, who when drafted was seen as a project also. Floyd, although injured in his first season, has shown flashes of a dominant linebacker at times and because of this. Fagio deserves the same opportunity to do the same with Edmunds. If the Bears don’t choose Edmunds, and instead chose Georgia’s Roquan Smith, they have a much different scenario on their hands. Smith is seen a polished and ready to start day one player who from an instinct aspect is ready to produce from the start. He would be the starting inside linebacker along side Danny Trevathan and would give the Bears a consistent tackling presence in the middle of the defense. There are few who have compared him to former All-Pro Patrick Willis who played under Fagio in San Francisco. Providing Fagio a linebacker similar to that of Willis could provide huge dividends to a Bears defense that has been missing since the time of Brian Urlacher and Lance Briggs. Smith is an instinctual, tackling machine, who although is undersized for the position, makes every play. The Bears have missed that consistent tackling presence and along with a dominant pass rushing threat is the difference between Fangio’s current defense and previously dominant 49ers defense. The 49ers and Oakland Raiders each are drafting right behind the Bears at No. 8, and are in desperate need of playmakers on defense. The 49ers needed help at linebacker alread but with the legal issues facing current linebacker Rueben Foster, they could decide to address the position at No. 9. Smith would be the safest pick for them as he would be a day one starter for them and offset the loss of Foster to an extent. Edmunds would be an enticing fit for the Raiders who are coming off an extremely disappointing defensive year. The team only generated 31 sacks and just five interceptions on the season. With the depature of linebacker NaVorro Bowman, the team only has linebacker Khalil Mack as a young pass rushing threat. Edmunds’ upside and potential All-Pro ability to rush the passer could fill the Raiders’ need of big plays on defense. If the Bears find themselves trading down, the team will have sacrificed quantity of quality to address their roster needs. They will still be able to find good prospects in the draft, but risk missing out a game-changing talent. Even moving down two draft slots, the team could miss out on both linebackers, each of which provides a high reward with their skill set. If a trade offer is presented, Pace and his staff needs to thoroughly analyze their options before making any decision.